Are you looking for a fun and simple way to decorate your child’s room or play space? 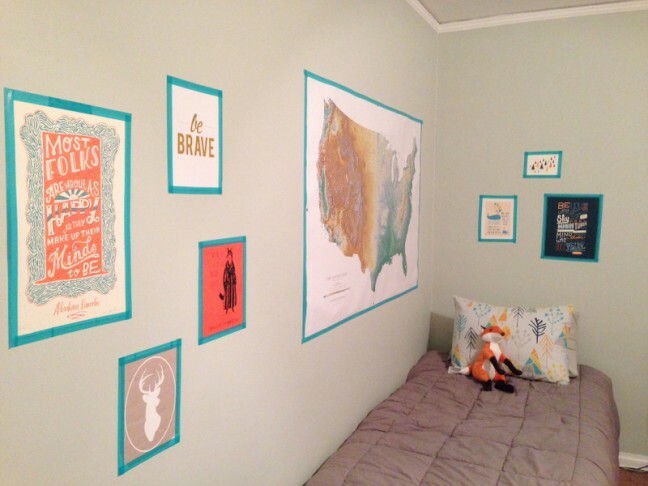 A washi tape gallery wall is the perfect project. 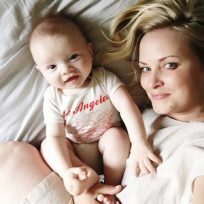 It is an easy way to incorporate art into your child’s room without hanging heavy frames, which can be knocked off walls and be a safety concern. I came up with the idea when decorating my son’s new “big boy” room. Living in Los Angeles, we have a strict “nothing hanging over the bed” policy due to the possibility of earthquakes. But all of the other walls in his room have windows, and I really wanted to create a large gallery wall of art for his room. So the washi tape gallery wall idea was born. 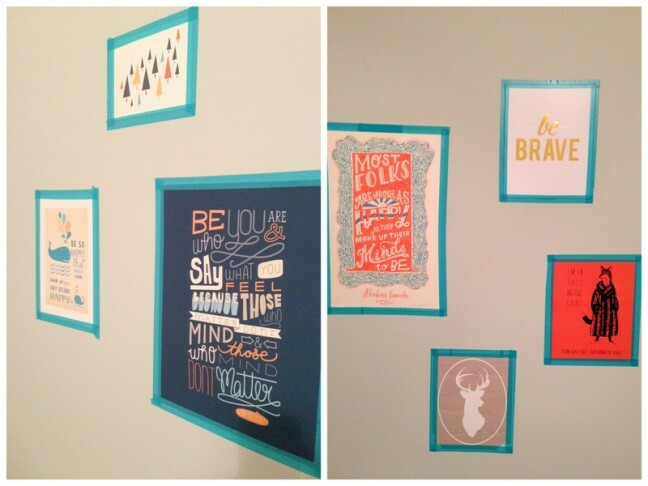 And it is so simple to create—all you need is the art you want to hang and some rolls of washi tape! 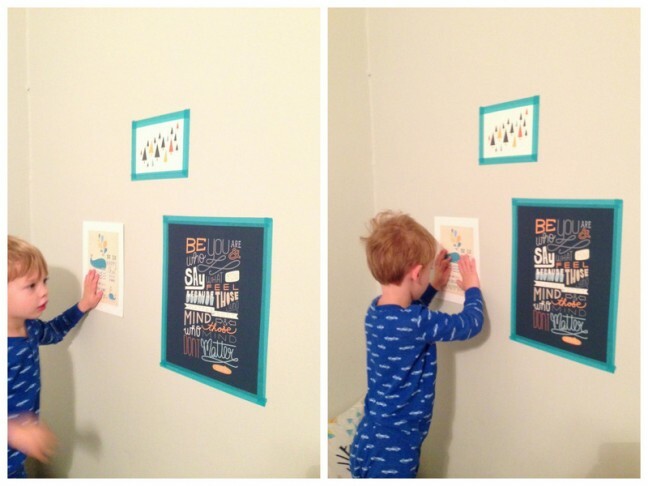 Step 1: Line up your art on the wall to decide where you want to hang it. I tend to do these things freehand and by eye, but you can also trace each piece of art onto butcher paper, cut them out, and tape them on the wall where you want the art to go. Step 2: Once you know where you’re putting your prints, start taping them up. 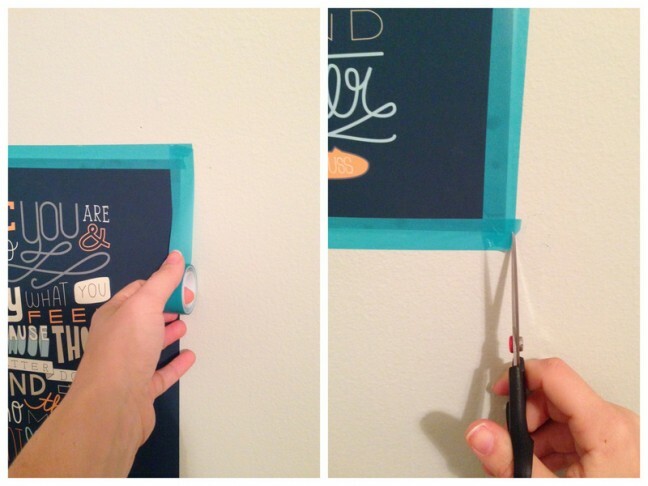 Since you’re using washi tape rather than hanging frames, you have to hold the print in place with one hand while you tape one side at a time. It’s easiest to unroll a bit of tape to get yourself started, and leave about an inch past the print for the tape to connect like a frame on all sides. If you can enlist help to hold your pieces in place, that is a bonus! Step 3: Once you’ve taped off all of your sides, cut the edges to make them neater if necessary. Step 4: Repeat on all sides until the art is hung, and repeat for all art until you’re done. Tip: I used the same washi tape for all of the pieces to give it a more uniform look, but mine certainly wasn’t perfect. But in the end I think it turned out great and was the perfect finishing touch to my son’s room. This would also be a fun way to display your child’s own art—you can constantly rotate in new art as they create new masterpieces.